Amazon launches $200 Echo voice-controlled connected speaker | What Hi-Fi? Amazon has continued to expand its online retail roots in 2014 with the highly publicised launch of both the Fire TV platform and the Fire-branded smartphone. But it's latest product it has taken us almost by surprise. Amazon's introduction of the Echo has not exactly been all-singing and all-dancing – but this $200 speaker is an interesting take on the now relatively common portable wireless speaker. 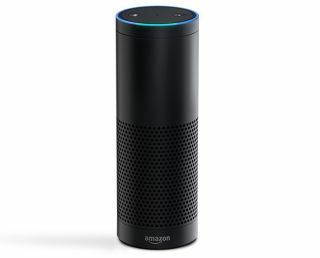 One of the integral features of the Amazon Echo is that it is voice-controlled; another is that it has a Siri-style virtual assistant that is "always ready, connected and fast". And it seems to be able to help with many things. For example, Amazon Echo promises to give you the latest news, weather and travel information if you ask for it. It also offers hands-free control for music services including Amazon Music, Prime Music, iHeartRadio and TuneIn. And with its Bluetooth capabilities, you will also be able to stream music from other services – such as Spotify, iTunes and Pandora – from your mobile. Meanwhile, cloud connectivity means it will add new features automatically. The 9.25in x 3.27in Amazon Echo features dual downward-firing speakers that, it is claimed, offer 360-degree, multi-directional sound. There's a 2.5in woofer and a 2in tweeter, with a reflex port to boost the woofer's output. At the moment, you have to "request an invitation" from Amazon if you want to get your hands on an Echo. And while it comes with a $200 price tag (that's around £125), Prime members can get it for $99 – approximately £60.